Normally I like to have the dinner ready within 15-20 minutes of hubby coming home, but last night I didn’t get a text until he already opened the garage door, so the meal preparation was all kind of chaos! Though this recipe is really simple to make, even with a frizzled cook it still turned out delicious! Cut the bean curd into pieces and pat dry with paper towels. Heat up your wok or deep fryer and add oil. 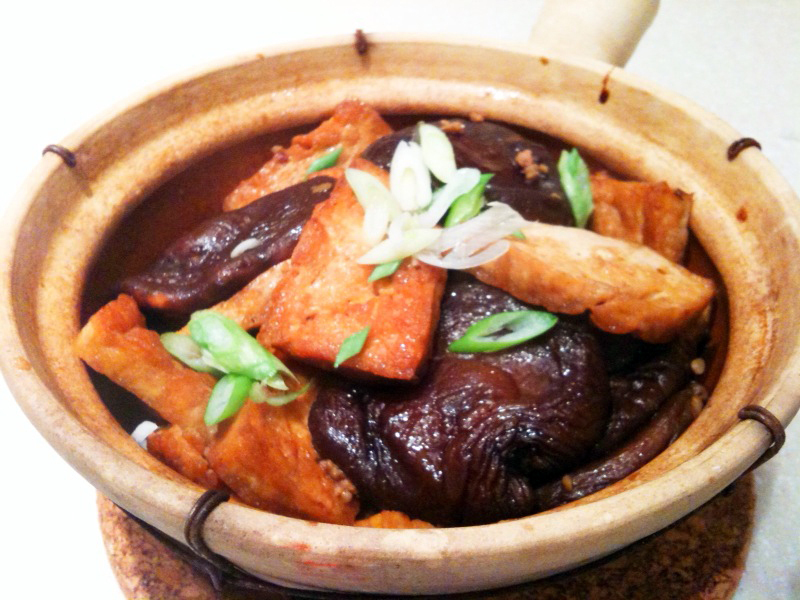 Deep fry the bean curd until light to golden brown, dish out and drain with paper towels. Set aside. Heat up the claypot and add 1 tablespoon of oil. Stir-fry the chopped garlic until aromatic and toss in the ground pork, do a quick stir before adding the mushrooms and the fried bean curd. Add all seasonings and water and cover the claypot with its cover. Lower the heat to low and let it braise for 15 minutes. Toss in the chopped scallion and serve immediately.